In the late 1800s, brothers William and George Struthers set out from St. Louis along the Lewis and Clark Trail. Their travels, part of the U.S. Army’s construction efforts, led them as far west as Walla Walla where the Struthers worked on building the local fort. Once there, the brothers decided to make the Walla Walla Valley home, and, like many in the area, took up wheat farming, a tradition that continues four generations later. 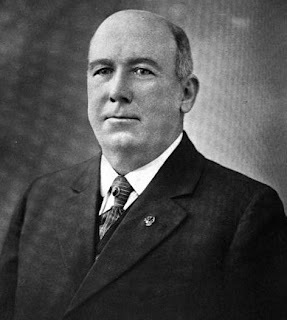 William Struthers’ great grandson Andrew Lodmell took over the family farm in 1989. 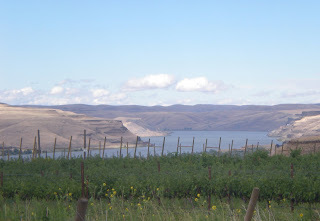 With Washington emerging as a wine region, in 1995 Lodmell decided to plant a fifteen-acre vineyard in a picturesque setting by the lower Snake River (see a video from Lodmell with shots of the area here). Lodmell says of the vineyard, “My philosophy of growing grapes is to allow the plants to grow and adapt to the site in as natural a way as they can and still survive.” Lodmell says that the shallow soil and fractured basalt make the vines struggle to produce fruit. The vineyard was recently expanded to a total of thirty acres and is planted to Cabernet Sauvignon, Merlot, Cabernet Franc, Syrah, and Semillon. For several years Lodmell focused on providing grapes to wineries throughout the state. 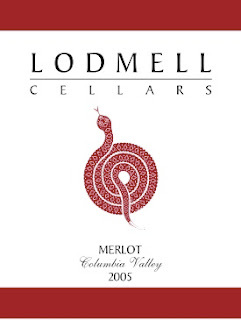 In 2002, Lodmell decided to make a Merlot to showcase the vineyard’s fruit. Encouraged by the response he received, he made his first commercial vintage for Lodmell Cellars in 2005. Lodmell Cellars is located in one of the ‘winery incubator’ buildings in Walla Walla’s airport region. The buildings were funded by the Port of Walla Walla in 2006 with assistance of an economic stimulus grant from Washington State. Three buildings were initially constructed and two were added in 2008. The five wineries that currently occupy these facilities are Adamant Cellars, Cavu Cellars, Kontos Cellars, Lodmell Cellars, and Trio Vintners. The buildings are intended to help start-up wineries reduce costs by providing high quality, discounted space. Occupants go through a competitive process to receive a six-year maximum lease. After six years, the wineries must find a new home, and a new start-up winery will take their place. Sadly, Lodmell Cellars will skip the 2006 vintage for their estate wines (the winery also sources fruit from other vineyards in Washington). On May 9th of that year eighty mile per hour winds swept through the vineyard along with hail large enough to dent the ground. Lasting almost thirty minutes, the storm completely defoliated the vineyard and resulted in one hundred percent crop loss. While such a storm might discourage some, this is a family that has been farming in the valley for many years and is sure to be doing so for generations to come. Lodmell Cellars produces 700 cases annually. Follow Lodmell Cellars on Facebook. Rating: * (Excellent) Dark in color. Nose is marked by pencil shavings along with spice, cherry and a touch of cola. Shows a bit of alcohol at times. On the taste, a big, brawny Merlot rich with cherries and light herbal streaks. 83% Merlot, 14% Cabernet Sauvignon, and 3% Cabernet Franc. Lodmell Vineyards. Aged in neutral French oak. 14.4% alcohol. 200 cases produced. Rating: * (Excellent) An alluring nose with spice, lime, and biscuit aromas. Crisp and acidic on the palate with a lot of mineral flavors. Definitely made to have with food. Alder Ridge Vineyard. 13.4% alcohol. Library wine. Rating: * (Excellent) Light straw colored. An appealing nose with spice, lemon, and fascinating floral notes on a clean aroma profile. Crisp and acidic on a well-balanced palate. 75% Semillon, 25% Sauvignon Blanc. Spring Creek Vineyard. Aged in French oak (20% new). 14.9% alcohol. 96 cases produced. Sampled at 62 degrees. Rating: +/* (Good/Excellent) Pale yellow in color. Somewhat muted on the nose with apple, lime, honey, plain yogurt, and yeast aromas. Crisply acidic on the palate with a lot of lime flavors. 100% Sauvignon Blanc. Spring Creek Vineyard, Yakima Valley. Aged in neutral French oak. 14.8% alcohol. 126 cases produced. Rating: + (Good) Lightly colored. A light nose with pleasing spice aromas along with cut hay. A crisp, acidic style with a lot of citrus and lemon flavors. Oak seems a bit heavy on the palate at times. Aged twenty months in neutral French oak. Spring Creek Vineyards, Yakima Valley. 12.1% alcohol. 90 cases produced. Rating: + (Good) Dark and inky in color. An aromatic nose marked by berries, spice, and game. Full and nicely structured on a rich palate that shows a lot of fruit. Occasionally comes off as a bit hot. Alder Ridge Vineyards. Aged 23 months in French oak. 15.3% alcohol. 100 cases produced. Rating: + (Good) Nose is marked by pencil shavings, black fruit, and spice. An appealing wine with a lot of cherry flavors and dark fruit on a fruit-forward palate. Barrel aromas get a little intrusive at times. 60% Cabernet Sauvignon, 40% Merlot. Rock River, Alder Ridge vineyards. Aged 36 months in French oak. 14.8% alcohol. 164 cases produced.